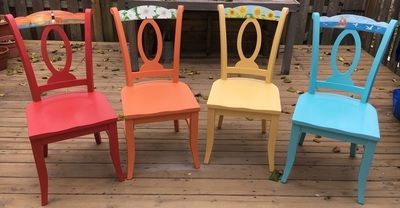 All chairs are cleaned, sanded, hand-painted (some include decoupage art) and finished with a durable polyurethane varnish to protect the art work. You may find small nicks and chips that add character for extra charm. All fabric seat covers are coated with ScotchGard fabric protector. 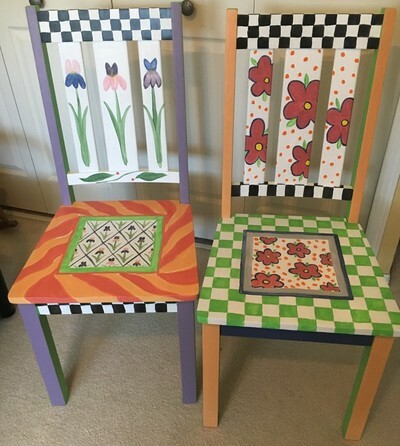 If you have a chair you'd like refashioned, or would like me to find and create a specific style of chair for you, please contact me through the CONTACT page on this site. Chairs with prices listed are currently available for sale, all others have already sold, but I'd be happy to discuss the possibility of creating a similar chair if interested. In order to eliminate transport costs and damage probability, all chairs will be sold locally in the Detroit metropolitan area. I had the privilege of refinishing a chair that was handmade in 1958 by my friend Mary's father. She decided on a painted finish (using Sherwin Williams Umber Rust All Surface Enamel) followed by a darker brown creme wax that I applied with a chip brush to give a subtle wood grain effect. Once I'd made a couple of minor repairs, I applied the primer, paint, wax and varnish. I started the upholstery part of the project by adding an edge roll around the perimeter of the seat to make the edges and corners more comfortable and add protection to the fabric from rubbing against the wood edges. I then cut and inserted a 1" foam cushion to fit into the inset base of the seat. Next, I topped it off with a 2" memory foam cushion to fit the wider portion of the seat and stapled on cushion wrap to secure the top foam before attaching the upholstery fabric that Mary had provided. (Although not pictured, the chair also included the separate wooden seat piece). Finally, I used my handy-dandy glue gun to secure a trim to cover the staples. While sanding the chair, I found an imprint made by Mary's father that I made sure not to cover. I'm thrilled that another generation will get to enjoy R. Trojan's handmade labor of love and superb workmanship! 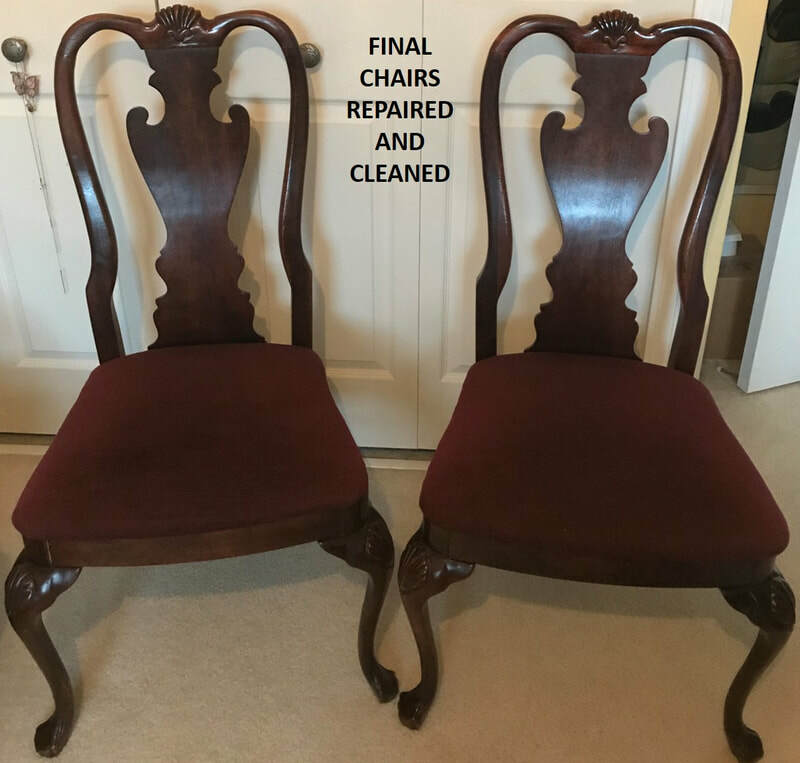 Two beautiful formal dining chairs had multiple breaks and large cracks that went completely through the top curved chair rail on both chairs and a couple pieces of wood that had come off of one. I was provided a replacement piece for the largest break, but it only filled half of the gap. I was able to use a hypodermic needle to inject wood glue into the breaks. I needed to clamp the glued sections but struggled to figure out how to clamp the curved rail. I was able to improvise with bungee cords and paint cans. I used wood-filler, paint and stain to fill and color the missing section. I used a stain marker to cover scratch and dent marks. I cleaned all the wood surfaces with Murphy's Oil Soap and vacuumed the cushions for an overall renewed look to both chairs. This small rocking chair was extremely weathered and in need of a little old varnish removal, sanding and conditioning. It also required exterior varnish since it will reside on a covered porch. It appears to be completely man-made. You can see the knife-whittled marks at the ends of the legs, and I've never seen rocker runners cut like thick skate blades. After lots of TLC, the wood color and grain ended up being among the most beautiful I've seen. Another cool project filled with lots of new lessons. 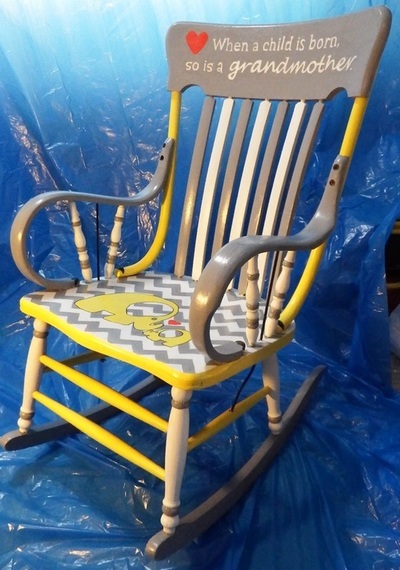 The goal was to restore this beautiful old rocker to a more youthful state. The wood was extremely dried out with a large crack running through the seat from back to front. It had wobbly front legs which I was able to tighten. The crack was strengthened and supported by two small boards glued, clamped then screwed into the seat bottom. "Challenges are what makes life interesting. Overcoming them is what makes them meaningful." I had several meaningful challenges on this project. 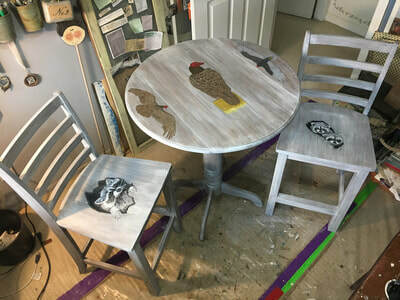 I was asked to give this table and chairs set an old barn wood finish and add turkey vultures and raccoons. (Yes, you read that right.)  The set was rescued from the curb and its new home will be a newly refurbished historic granary where the vultures and raccoons used to reside before the renovation. One chair was missing the stretcher between the front legs. The other chair was missing a chunk of wood at the base of a leg. After watching a few videos on the barn wood painting technique, and talking to Home Depot and Northville Lumber staff about the repairs – missions accomplished! The barn wood finish was achieved by first painting sections with dark walnut stain, remaining sections with classic gray stain; then covering it with a 50/50 mix of white paint and water and wiping it off before it dries; and finally, lightly painting wisps of white paint across the entire surface using a chip brush, barely dipped in the paint, to give a wood grain effect. I was asked to find two dining chairs to be used as accent chairs and paint them in Mackenzie-Childs style. (MacKenzie-Childs is a manufacturer of ceramics and retailer of hand-painted pottery and furniture with a very distinctive style.) Kathleen is a collector of Mackenzie-Childs pottery and sent pics of several of her favorite pieces. I've included pics below of a few that contained most of the design elements we decided to use. I created several concept sketches for her consideration and we worked together to come up with the final designs. I found the chairs on Craigslist - brand new, in the box and unassembled. I sanded off the glossy finish, primed all the pieces then assembled the chairs. Next, I lightly sketched out the design (the challenging part), followed by the fun part, painting on the detailed design, then varnishing. In an effort to give a fresh look to her dining set, Eileen decided to refinish and reupholster her four dining chairs. The ivory paint color and soft vinyl fabric made a huge difference and created a whole new style for her kitchen! 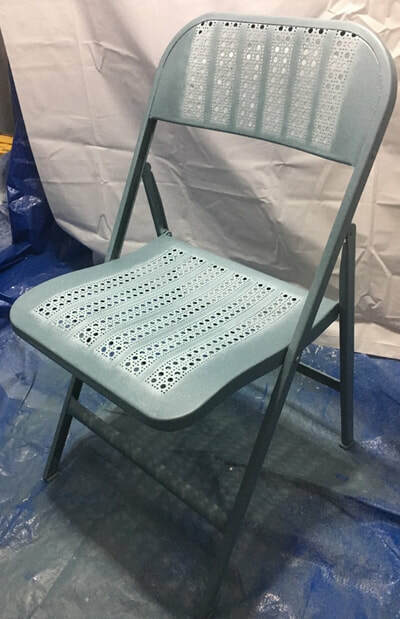 Her strong and sturdy chairs have plenty of use left and she was able to save money and help protect the environment by refinishing rather than buying new chairs. 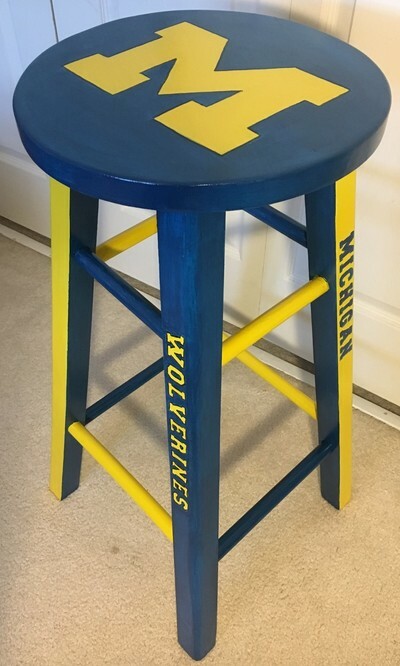 I painted this bar stool for my friend who has a huge U of M fan in her family. 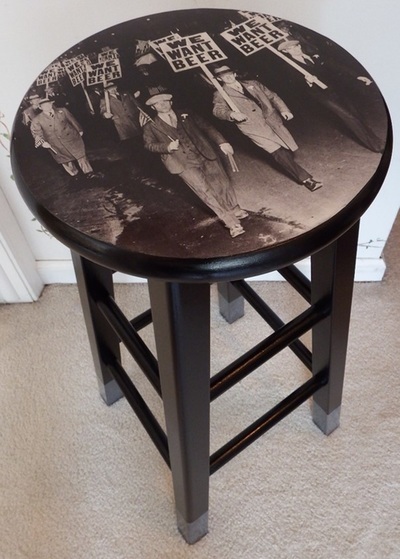 She provided the stool that just needed a good cleaning and sanding. I came up with the design and I was told Ryan loved his Michigan-themed Christmas gift. I learned a new skill! I now know how to install a pressed cane seat using cane webbing mesh. 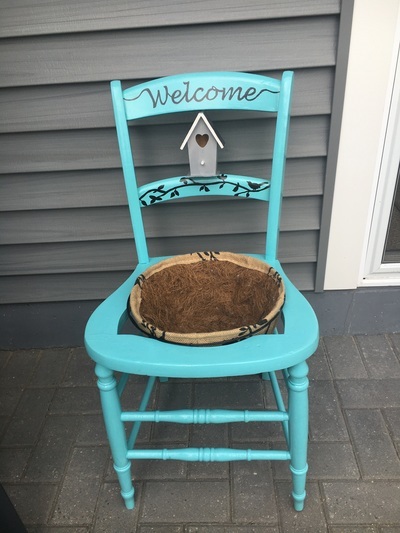 I would always shy away from cane seat replacement, (instead I'd make garden planters out of broken-seat chairs), until a neighbor friend made a special request. So, I did some research and watched some videos and discovered it's not as difficult as I thought it would be. Who knew?! 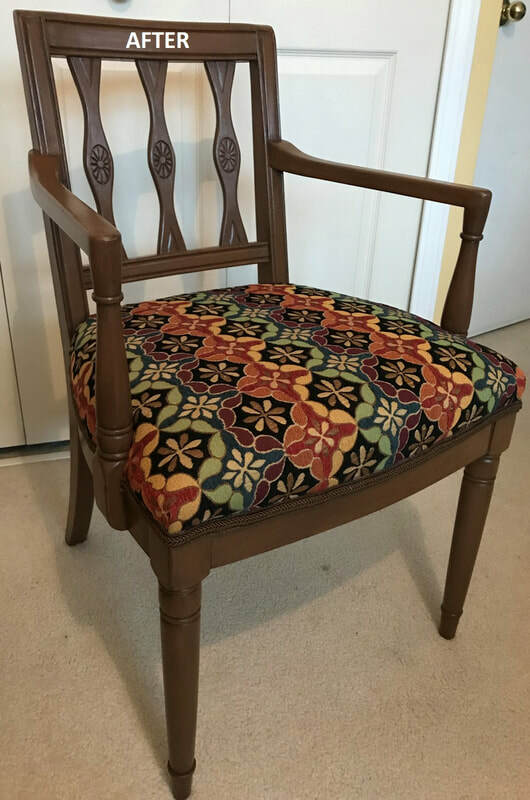 This chair was found at an antique market by a friend who wanted it refinished to match the house colors of her friends new home as a house warming gift. I especially like the smokey paint affect I was able to create with my new paint sprayer. I picked up this beautiful old chair at the Greenmead Flea Market. It had a broken woven seat which made it a good candidate for a garden planter. After filling the weave holes in the seat, I sanded, primed, painted and varnished all surfaces using exterior paint and 4 coats exterior varnish. I love the floral carvings in the top crest, the tiny spindles across the upper back and even the carvings where the back meets the seat. 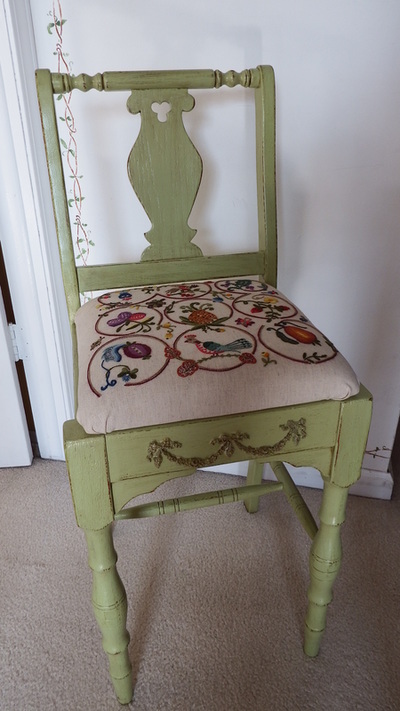 This chair has lots of old fashioned charm and could brighten up any setting. 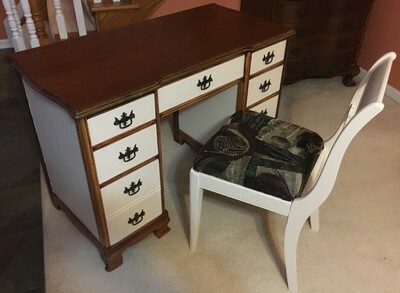 This old desk and chair belonged to my wonderful Aunt Vie. Her daughter, my cousin Pam, asked that I refinish it for her. We believe it originally belonged to our mutual grandparents. It was a very unusual wood refinishing project for me. The desk was made from multiple types of wood with seemingly no rhyme or reason to use. The front panel of all the drawers have a wood veneer surface. I always thought that the use of wood veneers indicated a recent production. But, it turns out that there is evidence that the ancient Egyptians were familiar with veneering techniques based on furniture retrieved from their tombs. I also learned that the use of veneer does not indicate inferior quality. In fact this desk, with it's dovetail joints in the drawers, appears to be very well made. I imagine this piece will remain in the family for future generations to enjoy. This old chair belonged to my friend's father, Eugene, who liked to sit in it when he played guitar. The chair sat in storage for decades collecting dust and in need of a lot of TLC. So I cleaned, repaired, sanded, painted and varnished the wood. I also replaced the seat board, cushion and fabric. 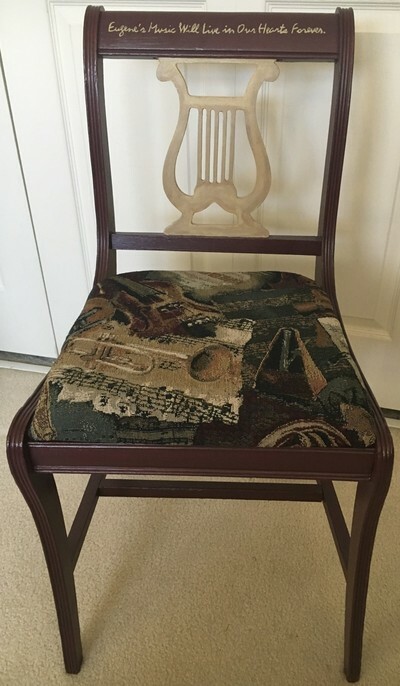 He asked that I add the sentiment to the top rail and he selected a music-themed upholstery fabric to compliment the Lyre Back style of chair. 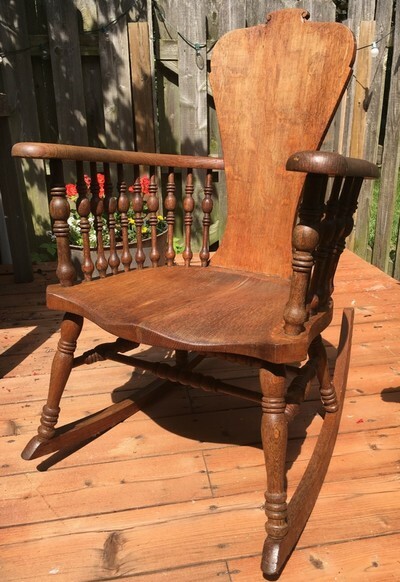 This elegant century-old Tiger Oak Press Back rocking chair with multi-turned spindles was purchased as a Christmas gift. It required cleaning and conditioning of the wood, some spindle tightening and new padding and fabric for the seat. These four contemporary chairs were ideal for what the new owner had in mind for her front porch in the quaint lake community of Port Austin. We met at the local Farmer's Market where I had my first market sales experience. She complimented my work and asked if I could find a set of chairs specifically for her. Once I found this set for her, she sent me a description of her desired color and fine art ideas for each and approved my first set of sketches. After the labor-intensive sanding removal of three previous layers of paint, I was able to get a new beautiful finish on each – thanks in part to sanding help from a friend and excellent Sherwin Williams paint! I found this chair at a garage sale and loved the carvings on the crest rail. The opening in the seat made it a perfect choice for a garden chair. 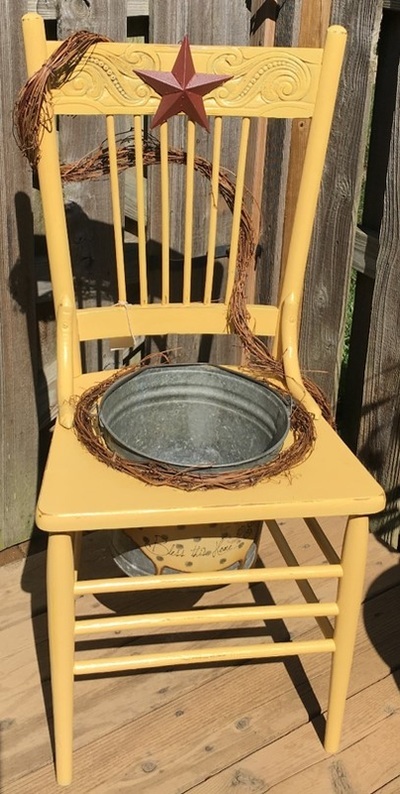 I found the bucket at the Greenmead Flea Market and felt it complimented the vision I had for the design along with the "Bless the Home" pig, metal star and grape vine. I drilled several holes in the bottom of the bucket for drainage. 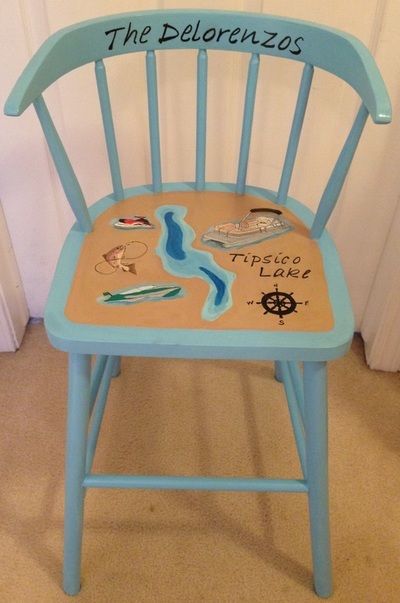 The chair has been painted with exterior paint and 4 coats of exterior varnish. Please keep in mind that even the best finishes wear and break down over time when exposed to the elements. So expect, that if left outdoors, the chair will most likely need recoating every year or two. My first Sweet Chairendipity garden chair was made as a hospitality gift for a friend. 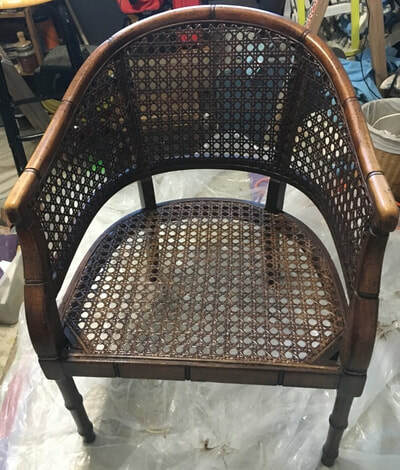 I began by removing the old woven seat followed by cleaning, sanding, cutting rounded edges into the seat-opening and priming. I then painted it with Sherwin William's All Surface Enamel Acrylic Latex for Interior/Exterior use. I also applied 5 coats of Varathane No Odor, Outdoor, Water Based Spar Urethane U.V. Protection Formula. And for the finishing touch, I attached a little wooden birdhouse (painted to match the house). 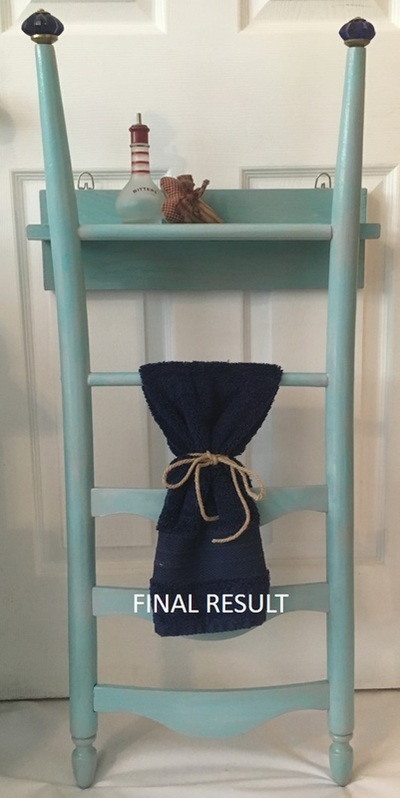 I was asked if I could possibly recreate a towel rack found on Pinterest that was made from a ladder-back chair . After a long search for the perfect chair and lots of learning, I'm pleased with the finish product. This cool old chair belonged to my friend's grandmother who was a basket weaver. My friend is also a basket weaver and makes homemade jams. She provided me with one of her grandmother's baskets along with her chair and asked that I create a country blue chair with a design on the seat that included the beautiful basket. 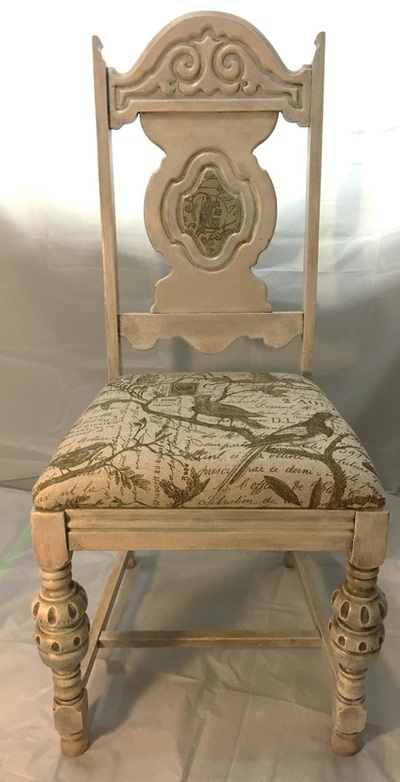 I experimented by applying a gray-weathered stain over the cream-colored paint on the seat to give it a more country look and it resulted in beautiful finish -- and made the grain in the wood underneath just pop. Love the result! 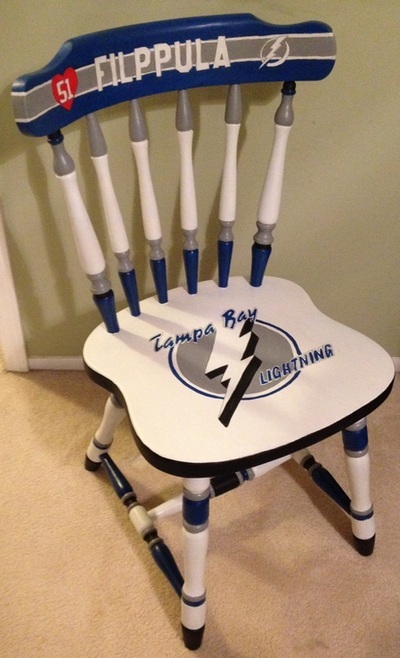 This chair design was created for a huge hockey fan, and more specifically, the Tampa Lightning forward, Valtteri Filppula. Her mom asked that I create this chair as a birthday gift for her daughter. I found this chair, in excellent condition, on Craigslist. It has a top rail, curved seat, turned spindles and eight stretchers which allowed for a fun design and fit the sized and style requested. 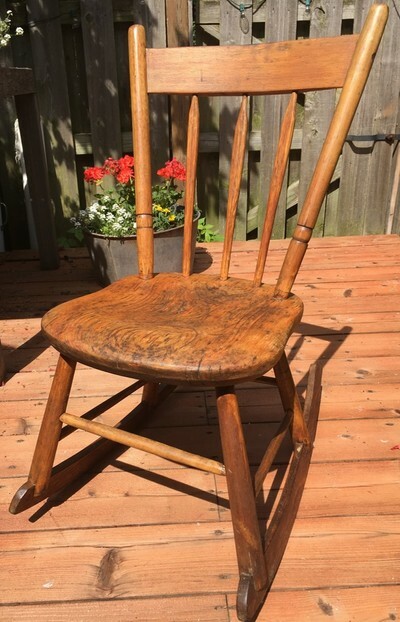 This early 1900s Queen Anne chair with fiddle back was donated to Sweet Chairendipity by a dear friend who hoped I'd be able to clean it up and give it new life. 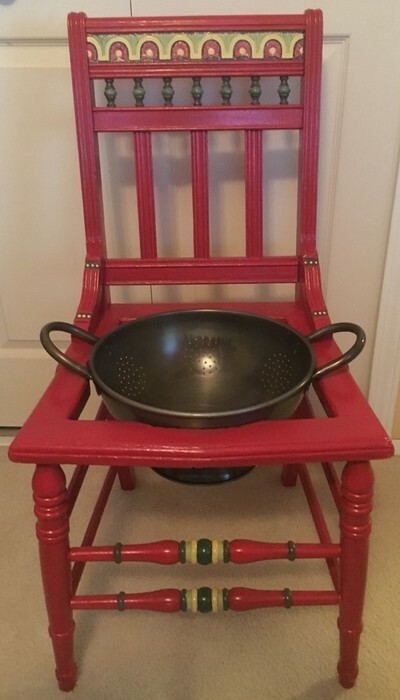 It was then chosen by another friend who wanted a Wizard of Oz themed chair to give as a Christmas gift to her daughter-in-law (who is a huge Wizard of Oz fan and actually wore ruby slippers on her wedding day). 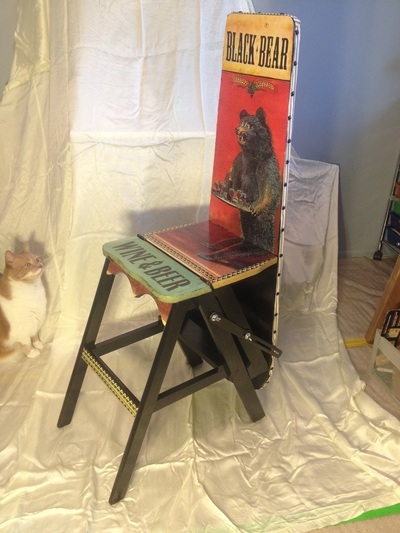 This unique tall child's chair was secretly rescued from the owner's basement to give it a new look and life in the family lake house. I was asked to put a map of the lake on the seat along with images of the activities enjoyed on the lake. 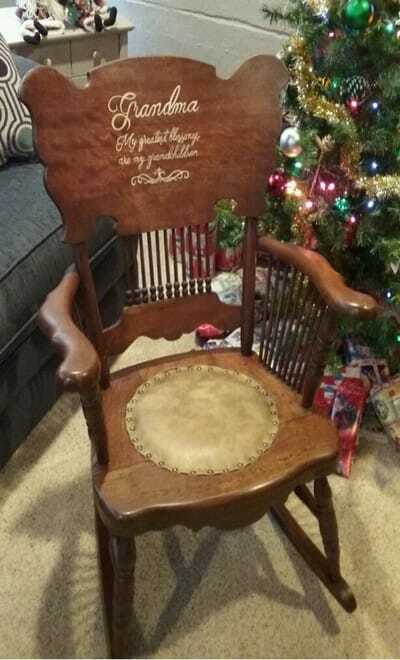 The chair was then given to the owner as a Christmas gift from his wife. 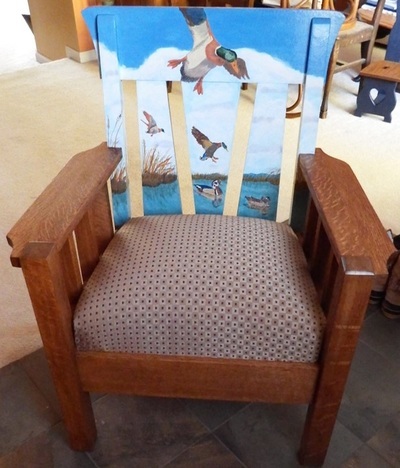 This contemporary desk chair was a special request from a friend who had just redecorated her home and wanted a new desk chair to match a painting and the furniture in her living room where the desk and chair would be. This exquisite antique, slat back, 1920's oak armchair rocker was brought to me by a new grandma for her grandbaby's nursery. It's bentwood arms and back supports, along with the black accent hardware and metal rod (to add arm support) all contribute to the charm of this beautiful chair. This chair is heavy, chunky, sturdy and very cottage-worthy. It was the perfect choice for the Michigan cottage and duck-hunter theme. After a thorough cleaning and sanding of the wood, a beautiful wood grain was revealed. So, I decided to offer design concepts that allowed for the duck painting and also plenty of natural wood. The new owner picked the fabric and I had a professional upholsterer add new springs, foam and upholstery. After applying a pre-stain conditioner to the wood for uniformity, I chose the Antique Oak shade of stain to match the colors in the fabric. I'm pleased with the end result and so is the new owner. This chair was donated to me by my sister-in-law. Although it's a relatively modern chair, the basic form of this Windsor-style rocker has changed very little since the early 1800s. With its tall straight back, crest rail over a spindle back, plank seat and turned legs joined by four stretchers – it's a very comfortable and stylish rocker. 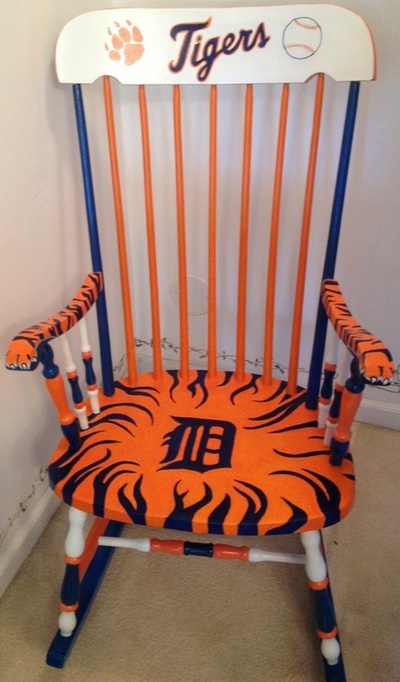 The Detroit Tigers theme was a special request from a friend who purchased it as a birthday gift for his friend's 70th birthday. I found this standard-sized bar stool at a consignment shop. I wanted to gift a Sweet Chairendipity bar stool to my friends who just celebrated the Grand Opening of their new brewery Oct. 9-10, 2015. They're amazing people with amazing drive, smarts, creativity, talent and dedication. I'm so incredibly proud to call them friends. Next time you're in Grand Haven, MI, you should visit the Grand Armory Brewing brewery for the best brews, wines, ciders, BBQ, live music, atmosphere and company anywhere! 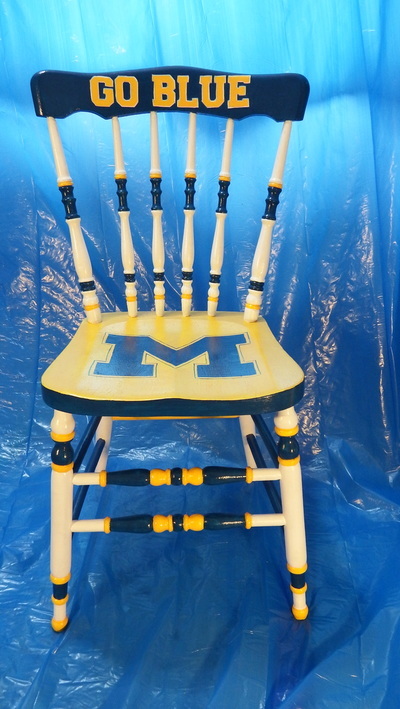 This chair design was created for a big University of Michigan fan who made a specific request for the chair type and theme. I found this chair at an antique barn. It has a top rail, curved seat, turned spindles and eight stretchers which allowed for a fun maize and blue design. I immediately saw the potential in this antique, carved-flower-back, saber leg, mahogany parlor chair. American Colonial homes included a parlor that signified a family's wealth and standing. Visitors were entertained in the parlor, so it was usually outfitted with the best furnishings the family could afford. During the Victorian era, the parlor became a fixture in homes of the affluent. Women's chairs had no arms, to accommodate their broad skirts, while men's chairs had arms upon which they rested their elbows as they smoked cigars and drank after-dinner brandies. This chair features a type of splayed furniture leg, which flares out in a concave shape, like a saber or curved sword (hence the name saber leg). This style of graceful saber legs caused the antique dealer to classify them as prime examples of early French Empire furniture. I found this chair at the Salvaged shop in downtown Northville. It was among the chairs that had not sold at the weekend warehouse sale and I decided I needed to breath new life into it. I tried to find a fabric that complimented the flower engraved on the back of the chair. 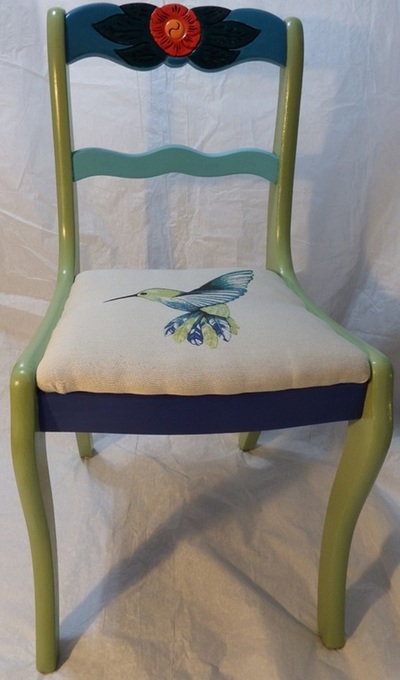 Once I found the hummingbird square of fabric, I knew I had to bring those great colors into the chair. 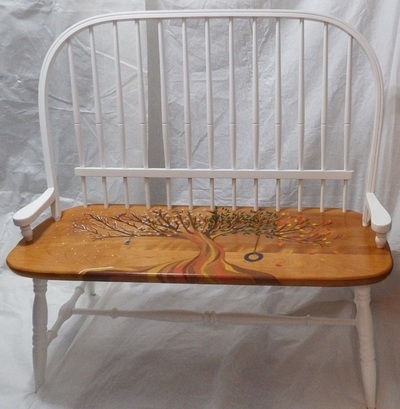 This is a comfy vintage ladder-back rocker with scalloped slats and turned posts, rolled arms, a formed seat along with turned legs and stretchers. 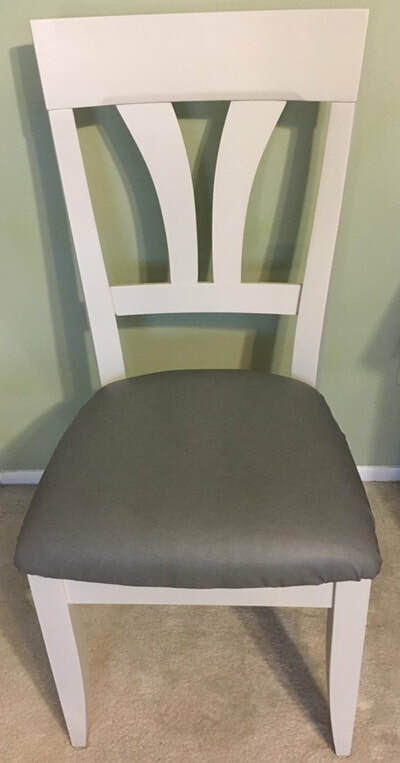 I chose this chair from "The Old Furniture House" because it has character, durability and lots of paintable surfaces with it's wide back slats and arms. 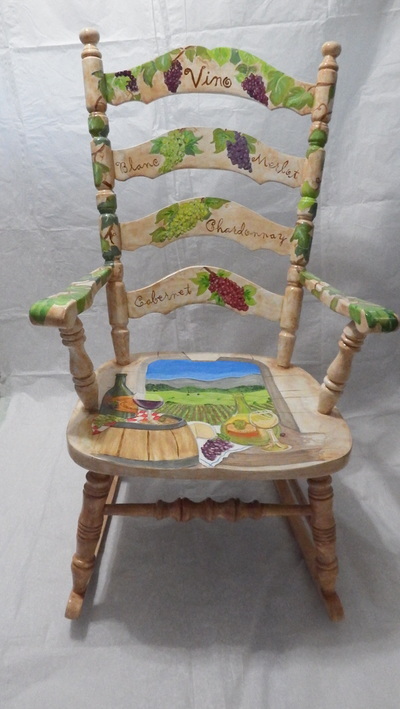 It was suggested by friends (during a wine party), that I paint a wine-themed rocking chair for a porch. This is the result. I applied 4 coats of outdoor spar urethane that provides U.V. and weather resistance. Please keep in mind that even the best finishes wear and break down over time when exposed to the elements. So expect, that if left outdoors, the chair will need recoating every year or two. Cheers! This is a 1930s ironing board chair (aka Bachelor or Jefferson chair) that I found in an antique barn in northern Michigan. It was my first Chairendipity chair purchase. I immediately fell in love with it's uniqueness and versatility. This style of chair was first conceived in the 18th century, the wooden, multi-purpose (chair, step stool, ironing board) piece of furniture is believed to be one of Thomas Jefferson’s many inventions. It was a much bigger challenge to refurbish than I anticipated, but I learned a ton and love the end result. The seat and front panels are decoupaged with a vintage wine & beer poster. The ironing board has been recovered with a tough utility fabric. I found this classic rocking chair on Craigslist. 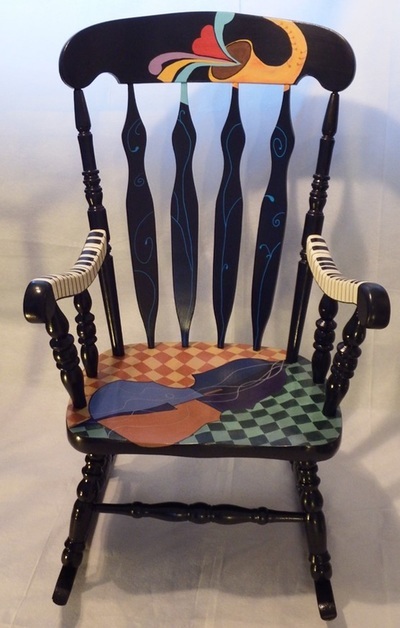 I wanted a sturdy and comfortable rocker that I could add a design that would welcome any music listener. It includes a matching jazz-themed pillow (18" x 18" with a removable cover for easy laundering). The pillow (and Miles Davis) provided the inspiration for my art work. 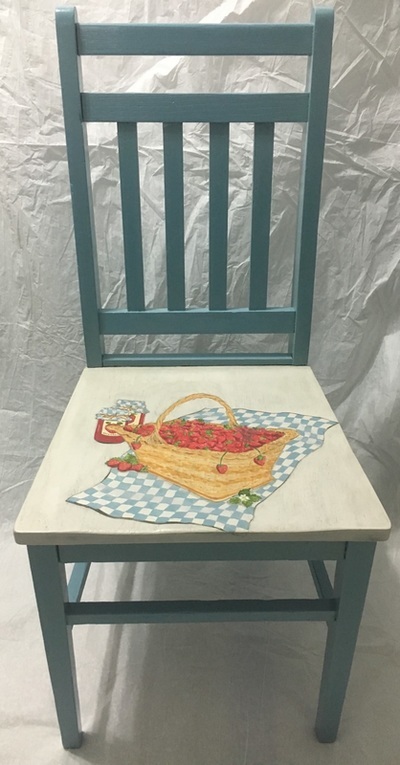 I found this rustic counter-high chair at an estate sale along with the hand-stitched needlepoint fabric square – both were found in different rooms of the house. The needlepoint was sized perfectly to reupholster the seat. Based on my research and the aged condition of the seat fabric and cushion, this piece appears to be from the 1930s or 40s. It seems that the original owner had stitched the beautiful needlepoint specifically for the chair which desperately needed a new cushion and cover. I was so happy to complete the project for her! This chair is made of metal with a solid oak seat. 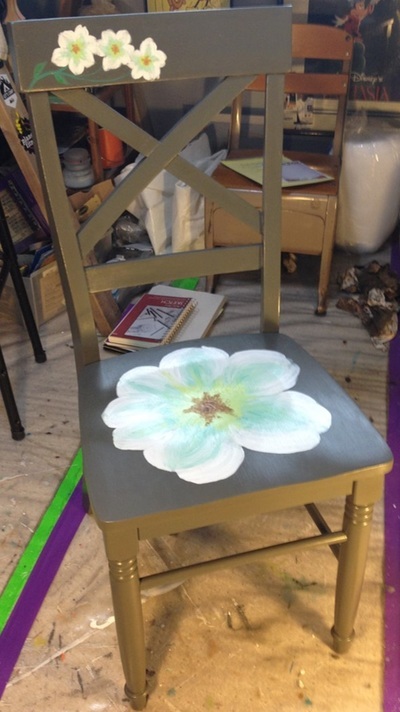 The lily image was painted on the seat using a dark stain applied with my finger tip, rather than a brush, to allow for a soft blending application. I chose stain rather than paint in order to allow the beautiful natural wood grain to show through. I found this 1920s Elizabethan-style dining chair at a garage sale. I was immediately attracted to the bulbous turned legs. The heavy, melon-like wood design was popular during the early Renaissance in Holland, England, France and Italy, and common to most European styles from the Renaissance on. The Dutch passed it on to the English, who made it an outstanding characteristic of their furniture in the 16th and 17th centuries. I had to replace the seat board, cushion and fabric and tighten all the joints. I also decoupaged a section of the fabric to add decoration to the center section of the back panel.